Almost every Google application such as Google Desktop, Google Toolbar, Chrome, Picasa, and Google Earth uses tracking cookies or a unique ID to transfer data back to Google. Although Google has guaranteed the privacy of users that the data won’t be misused, but Google can use the data to identify which websites users most visit, and user behaviors. In this case, the utility software such as GoogleClean will be helpful to switch off Google spy functionality. Abelssoft GoogleClean, a Google cleaner, is easy to use utility software that can protect personal data by cleaning Google traces, delete tracking cookies, and automatically keep system clean. With GoogleClean, user IDs can be made anonymous, personal data can be deleted and spy cookies can be destroyed. In addition, this user-friendly application also can find and delete local data of Google web applications like YouTube or Google Mail with just a few clicks. Delete Tracking-Cookies which enables websites to track much information like how long you remain on a certain web page or what for links you click. Protect your computer automatically where Google Radar starts up with Windows and will keep your system clean automatically. 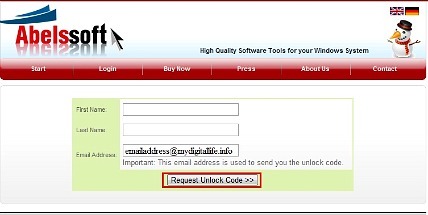 Enter your name, and email address, then click “Request Unlock Code” button as shown in below image. An email from “Abelssoft-software.com” will be sent to registered email containing the registration key for GoogleClean. Install Abelssoft GoogleClean, start program and select “Unlock Full Version”. Enter the registration key and click on the “Unlock now>>” button to unlock the program. 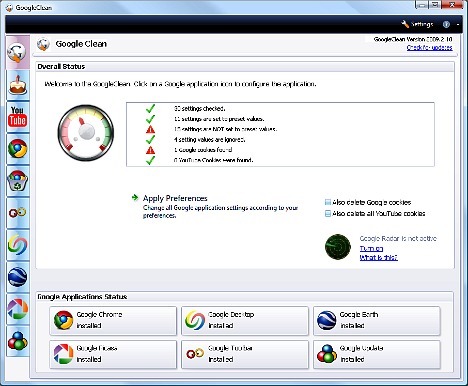 Abelssoft GoogleClean supports Windows XP, Vista, and Windows 7.